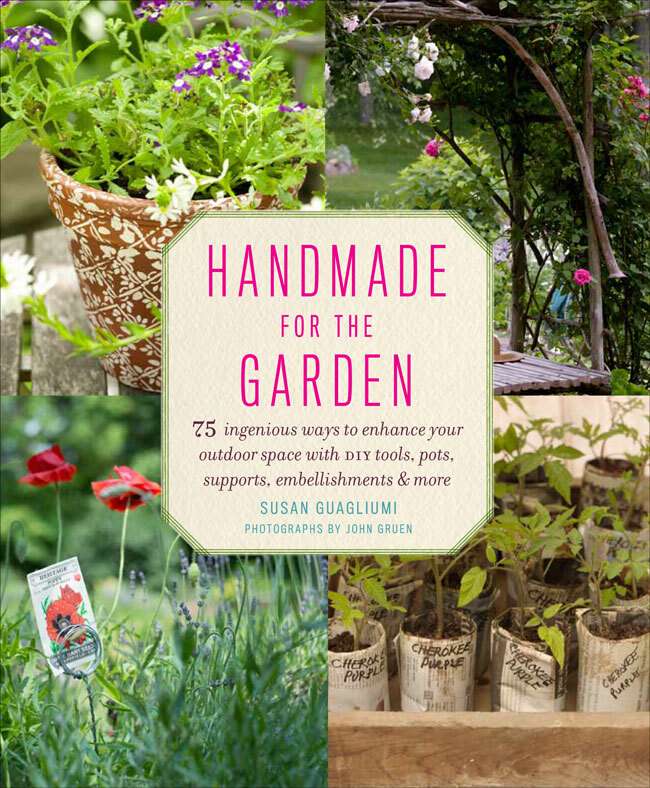 Due in March 2014, you can pre-order your copy now from Abrams Books! The new site now has a “subscribe” button to click. Sorry for the Twitter confusion! My blog address is now http://guagliumi.com/blog, but the move has left all of you behind! Please go to the new site and re-click “follow” so you don’t miss any gems of wisdom. Two of the main reasons for me making this shift in hosting were for the ability to offer free downloads and to post some videos. 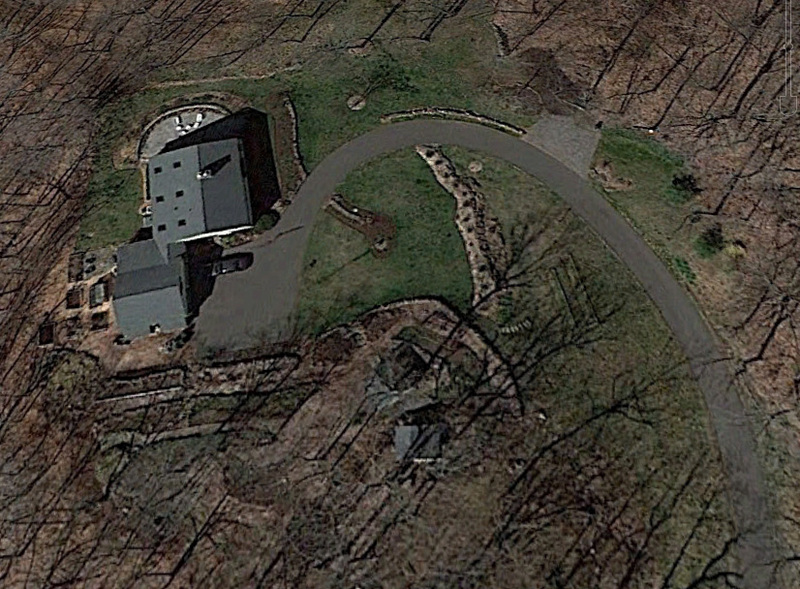 If you haven’t tried Google Earth yet, just go to googleearth.com, type in your address, zoom in close and see how your gardens look from above! This screen shot will give you an idea how my gardens look – the picture can’t be that old because the white patio furniture shows up on the patio at the left corner of the image and we just pulled it out of storage a couple of weeks ago. I just received my order of “Sugru” and can’t wait to try it! You can check out their web site for detailed information (www.sugru.com), but, briefly: Sugru is a moldable silicone product that hardens in 24 hours, remaining flexible. It adheres to almost anything, which makes it ideal for all kinds of repairs. I’ll let you know what I use it for and how it works out when I have some time to play with it! Many years ago I purchased two old Popular Mechanics books at a used book shop. The information is great and while some of the projects (like a garden windmill) aren’t quite my style, some of the other ideas are terrific! 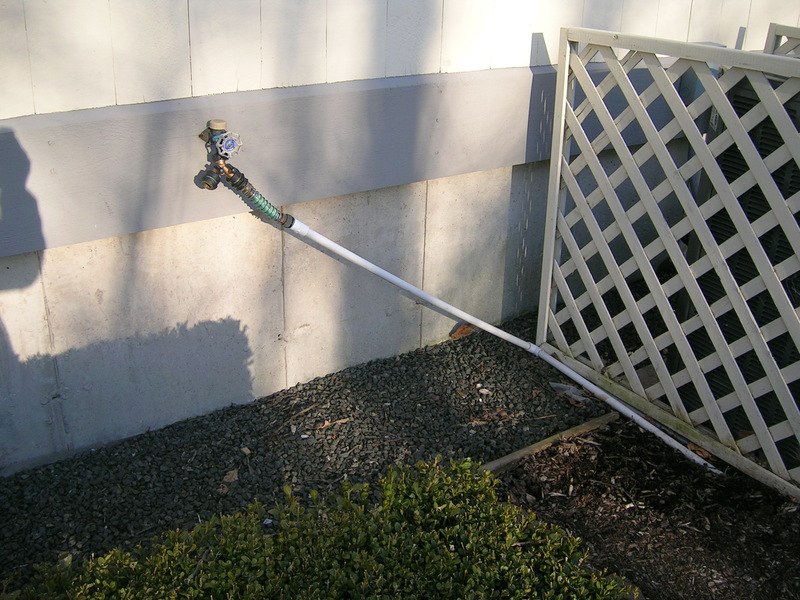 Three well placed holes are all it takes to secure a hose for an instant sprinkler or garden faucet. 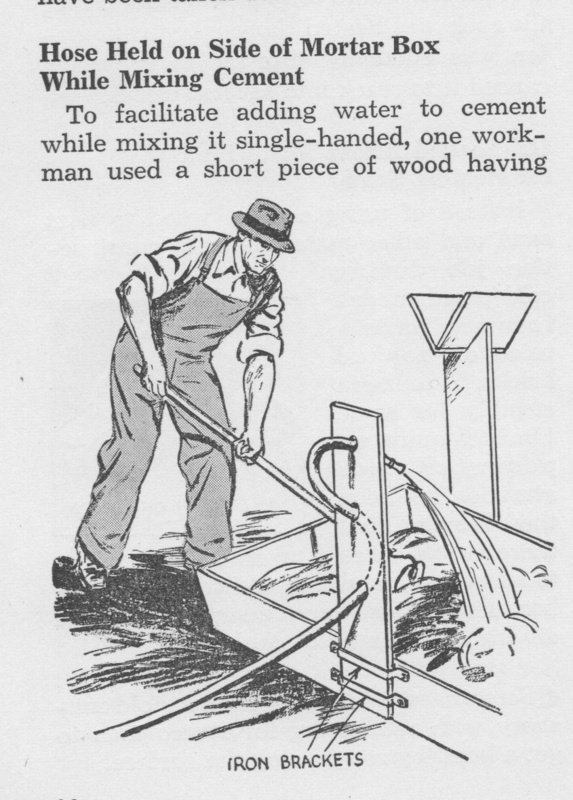 This hands-free hose holder is from the Concrete Handbook that Popular Mechanics published in 1943. They showed it braced to the side of a cement mortar box, but I think I might make one that is sharply pointed at the bottom so I can drive it firmly into the ground. 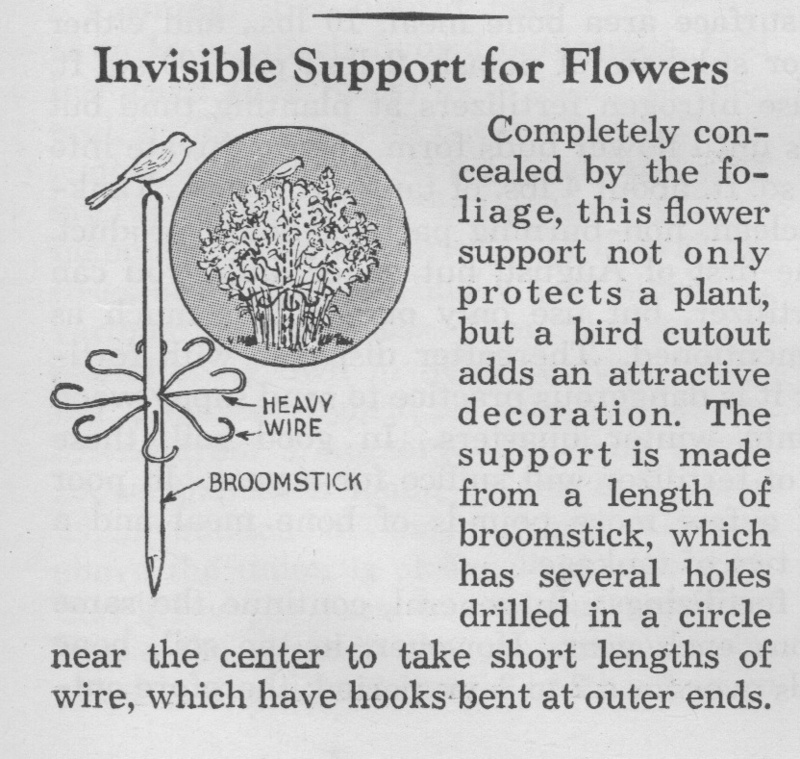 With or without the bird, this is a very clever plant support! I love the idea of this plant support! I often purchase cement and clay birds when I find them at shops or tag sales and will just mount one of them atop the post. I think this is a very clever project! It appeared in the 1942 Popular Mechanics Garden Book. The first of the year’s wood chip deliveries! 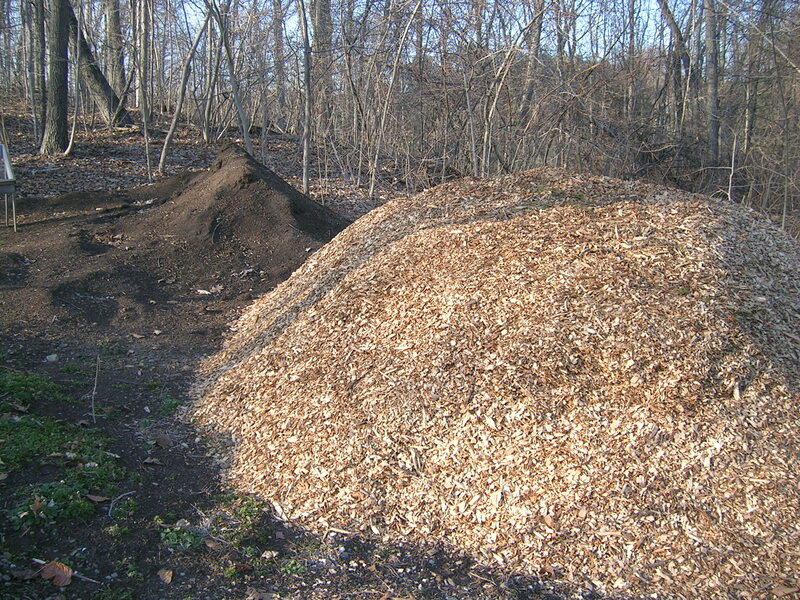 Our local landfill charges a fee to dump wood chips so I have been able to get 2-3 huge loads every year from one of our local tree companies. I use them to mulch the currants and gooseberries, the blueberries and all of the walkways in the shade gardens and between the raised vegetable beds. I’ve heard that ticks don’t like to cross wood chips so maybe that is an added benefit. Last year I invested in a DR Power Wagon and it was the very best garden investment I have ever made. It is a gasoline powered wagon with a large capacity and an automatic dump-loader. My idea of heaven on wheels! 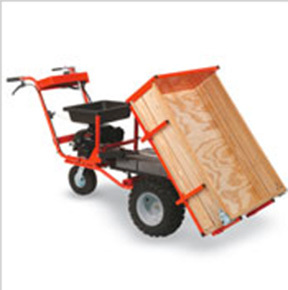 Check them out at http://www.drpower.com It makes it a snap to move wood chips or soil! Slowly, the woods are giving way to a roadway and an improved view! Our neighbor is planning to finish the access road to his lot at the top of the hill and while he is here with the backhoe, has said he will dig the holes for some large pines to put along the boundary. 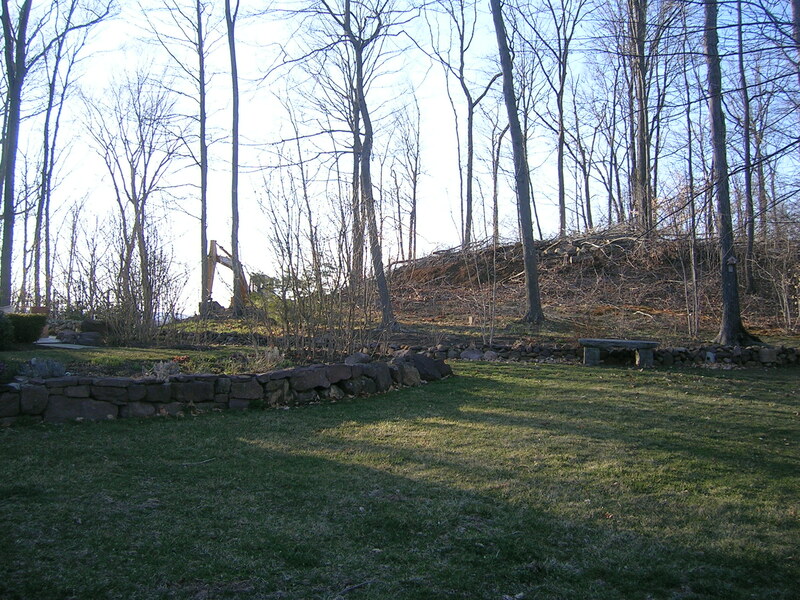 I’m kind of looking forward to him finishing already – and being able to landscape the hillside a little bit. Our view of Sleeping Giant and the valley is improving daily! Last blog I told you about the Lee Valley irrigation system I use, but I didn’t mention that my blueberry patch is on the far side of the property, which required me to drag long, heavy lengths of hose a long distance to water them. Several years ago we installed underground water lines to the front field where the blueberries grow, to the shade garden at the top of the hill and to the vegetable beds at the back. I also ran a short line off one of those to supply water inside the greenhouse. This is not a high tech system, just lengths of 1/2″ PVC pipe that we bought in 10′ lengths and joined together with couplers and PVC cement for the required lengths. The lines are buried less than a foot below the sod (on our rocky lot) and so need to be drained every fall to avoid freezing and cracking them. To facilitate this, we made sure that, where possible, the lines run down hill. Where they don’t, we just turn off the water at the source while the hose on the end remains open fully to get most of the water through the lines. We have also been known to physically blow in the end or place the leaf blower over the pipe. Just to be sure, we always leave the end faucets open for the winter so that, if there is any expansion, the water has a way out. The line runs under the lawn up to the house, where it connects to the back faucet. Where the pipe comes up out of the ground at the beginning and end, you need some fittings. At the beginning, you need a way to attach the pipe to the faucet, which requires an adaptor to match the two pipe threads. 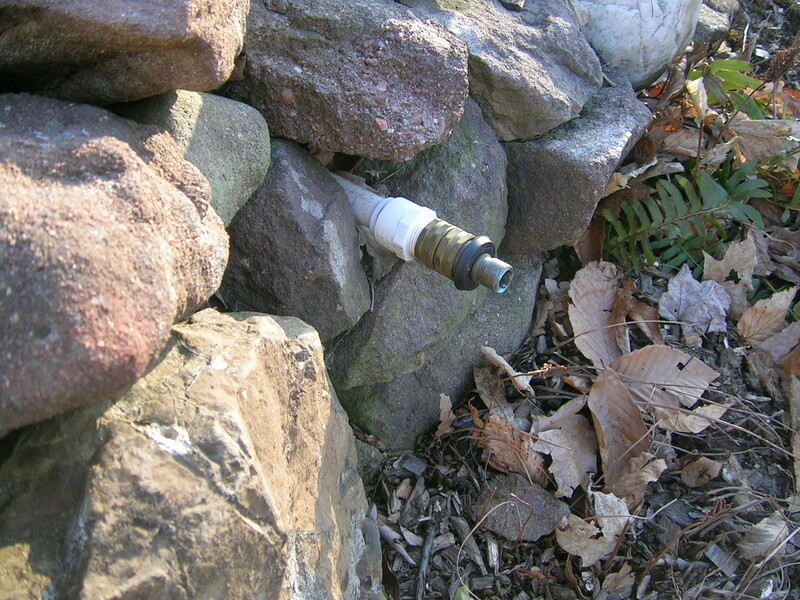 Also, it is nearly impossible to screw the length of buried pipe onto the faucet, but a quick connect hose fitting solves the problem. At the other end, you need an elbow to bring the pipe up out of the ground and, once again, adaptors to match up the gauges of the pipe threads. The line that runs out to the vegetable garden, including all of the fittings, cost less than $30 installed. I relied on the kindness and expertise of an old time plumber who works at our local Lowes to figure out what couplers and adaptor I needed to buy. The system is inexpensive, easy to build and it works like a charm. Best of all, it reduced the physical labor needed to drag 100′ hoses all over the gardens and I now have shorter hoses hooked up in a number of locations. Hopefully the following diagram will be enough to get you started planning your own system. It probably seems strange to start thinking about watering systems so early in the season, but this is the time to think about installing water lines or systems that that need to be in place before the plants emerge. I lay soaker hoses in some of my perennial beds and laced through the raspberry patch just in case we get a very dry spell and I need to water them. However, I use another system altogether for my blueberries – which are heavy drinkers – and my tomatoes. The “shrubbler” system I purchased from Lee Valley Tools is the best system I have ever used. It uses less water because it concentrates the water around the plants I target, rather than watering all the ground in between. Each plant gets its own little sprinkler or shrubbler, which can be adjusted to spread over an area as large as 3’. Because they are only about 8” off the ground, they also do not splash over the foliage – they just soak the ground. The basic set up costs about $49 and can easily be expanded. Check it out at www.leevalley.com in the section with low flow watering devices. Many people shy away from irrigation systems because they look difficult to install and appear unsightly among the plants. 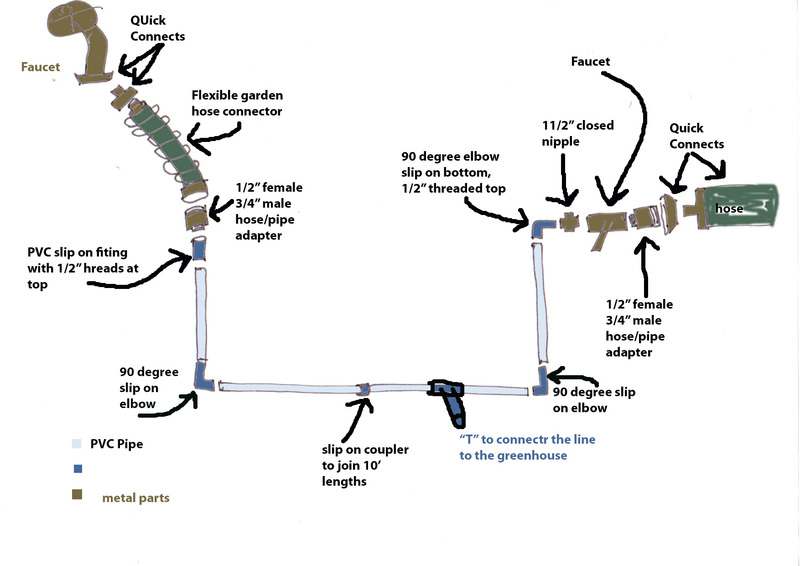 However, this system is quick and easy to install, and much of it can be buried out of sight, just below the soil surface.Unlike many drip irrigation systems, this one uses unique “Shrubblers” that are adjustable to emit from 0 to 13 gallons per hour (at 30 psi). Although Shrubblers are generally unknown to most gardeners, they are an industry standard in commercial irrigation, where tens of millions of them are sold yearly for use in commercial plantings, nurseries and garden centers. When a Shrubbler is fully open, it will irrigate a 3′ dia. circle. At lower settings, it works like a very small sprinkler or drip tip. Included in this system are 25 regular Shrubbler spikes, 50′ of 1/2″ poly header hose, 50′ of 1/4″ feeder line, various connectors, an in-line filter, a hole punch and instructions. Extra components are available, should you wish to expand it. 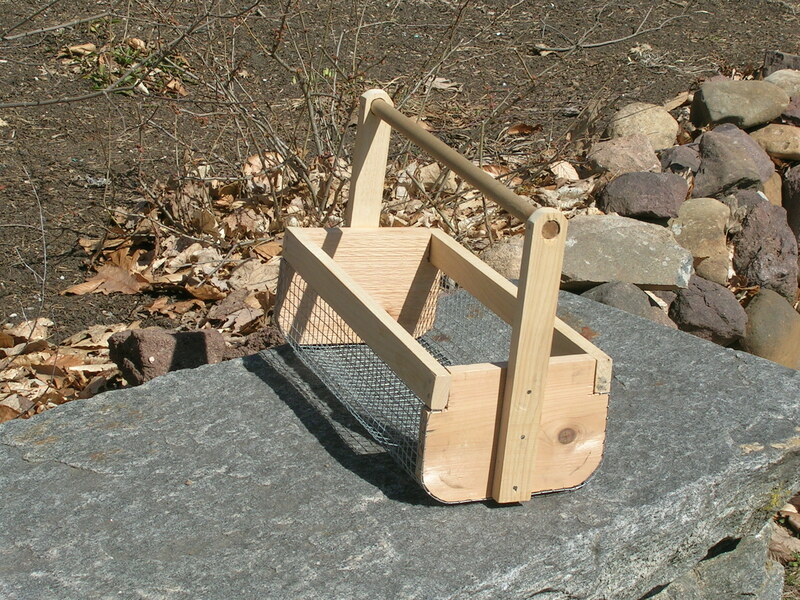 I’ll use this hod for washing and carrying veggies in from the garden this summer. According to Webster’s a Hod is a tray or trough that has a pole handle and is borne on the shoulder for carrying loads (as of mortar or brick). None of the garden hods I have seen in recent years would be carried on the shoulder, but they do have a pole handle and are used for carrying produce. 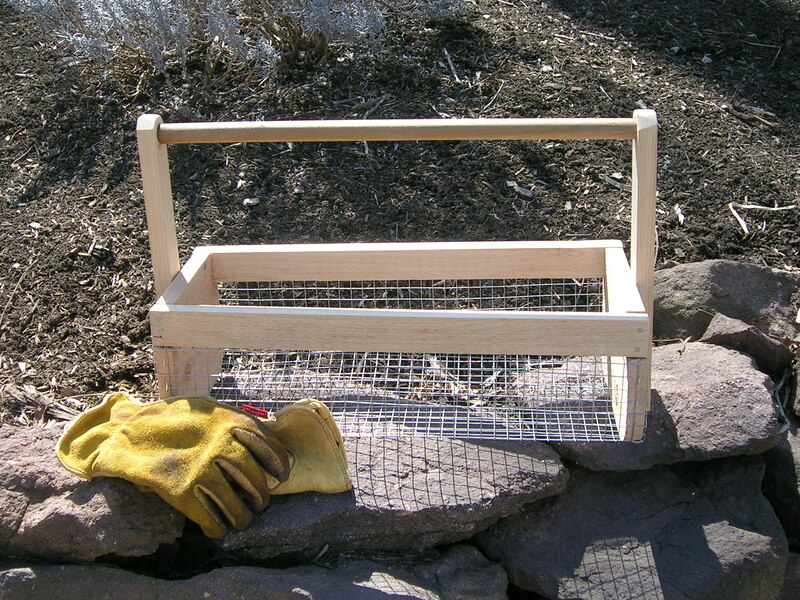 I’ve been eyeing some beautiful hods at the garden center and, while they weren’t overly expensive, I was delighted when I found the directions for building my own at http://www.runnerduck.com. You’ll need a drill bit large enough to accommodate the dowel handle. The directions are brief, but easy to follow and the only thing that might be tricky is drilling holes large enough for inserting the dowel handle. I used a spade bit (like the ones I used for the Yule Deer 11/18/12), with the handle suports held firmly in a vise. I really do need to get a drill press one of these days. Hardware cloth is one of my favorite craft materials (see Suet holders 1/10/13) so I had some regular galvanized HC on hand. I plan to build another hod – maybe a little bigger – with some green coated HC. Meanwhile, I have received the first proof of the layout for the book and it is gorgeous! We’ll go through a couple of rounds of revisions and then send it off to the printer by fall. We’re right on schedule for an early spring 2014 delivery! 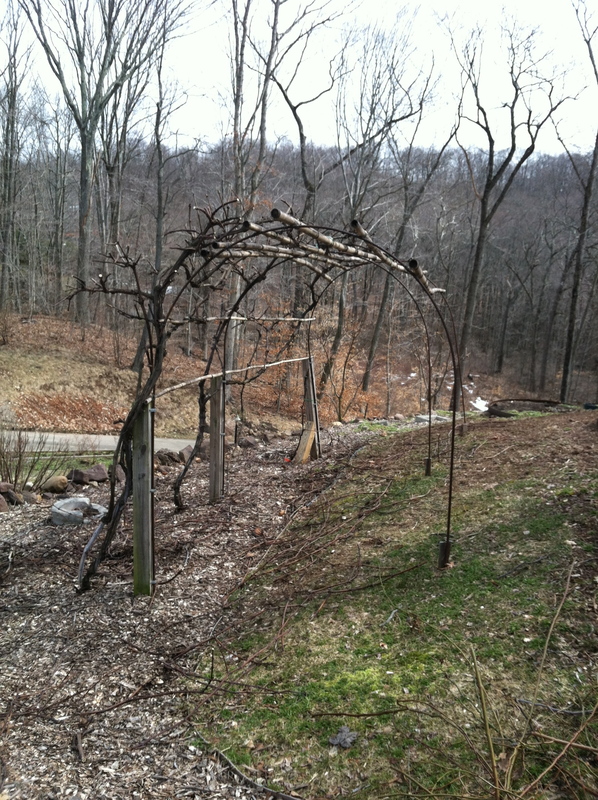 Grapevines will cover this rebar arbor by mid-summer. Hopefully, there will also be a decent crop of red grapes! It was bitter cold here today, but I was determined to get outside to get everything pruned and ready for spring. Apricots, quince, grapes, roses, red and black currants and gooseberries. I was ruthless! We always have far too many red currants so this year I decided to lop off all the branches that are too low to pick comfortably, regardless of whether they were new or old growth. Maybe in addition to easier picking, the berries will be even bigger! Some of my pruning methods are still by guess and by golly, but everything looks so trim and spare right now. Hard to believe that by the middle of the summer, the rose canes will be up and over the arbor and – with any luck – I will be loaded with ripening apricots and quinces.